In the summer of 2013, a group of more than 100 Mueller residents staged an “eat-in” at the original Kerbey Lane Cafe to show just how much they were hoping for a Kerbey to open in their burgeoning neighborhood. Check out the exclusive Austin American Statesman Article here! Four years later, the neighborhood’s dream is coming true—Kerbey Lane Cafe will open in Mueller in the fall of 2018 on Aldrich Street, the neighborhood’s vibrant activity hub featuring a mix of local shops, restaurants, parks, and cultural attractions. Voted Best Breakfast by the Austin Chronicle for more than 20 years, Kerbey Lane is famous for its pancakes, queso, and seasonal menus; for giving back to the community; and for being a great place to work for its 600-plus team members. 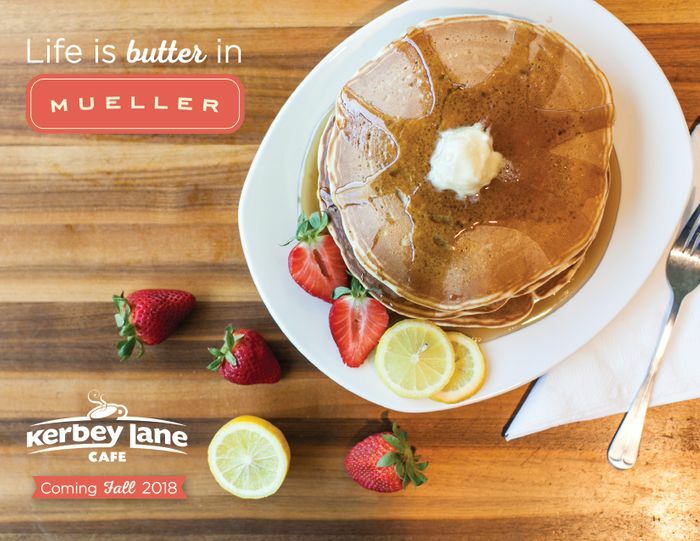 “Bringing Kerbey Lane Cafe to Mueller is a dream come true for us as well as the neighborhood,” says chief executive officer Mason Ayer, who is the son of Kerbey Lane founders Patricia Atkinson and David Ayer. “We’re big fans of Mueller’s diverse, sustainable, and walkable community and are looking forward to being a part of this dynamic urban village in the heart of Austin,” Ayer says. "The ‘eat-in’ at Kerbey Lane Cafe was our first and the largest gathering of its kind,” says Kathy Sokolic, past president of the Mueller neighborhood association and an organizer of the 2013 event. “It’s safe to say that Kerbey was our top pick for a local restaurant to come to Mueller. It’s iconic Austin, great food and atmosphere, and is just a perfect fit for the neighborhood. For the 100-plus people who came to show their support in person back in 2013, and many other Mueller residents, being able to walk or bike to Kerbey Lane in their neighborhood is going to be a dream come true,” Sokolic says. Kerbey Lane Cafe Mueller will be the eighth location of the iconic local restaurant, which began in 1980 in a small house on Kerbey Lane and quickly became one of Austin’s most beloved places for breakfast, late-night dining, and everything in between. Kerbey Lane Mueller will be on the ground floor of the Texas Mutual Insurance Company headquarters building, currently under construction on Aldrich Street between Philomena and Garcia streets. The newest Kerbey will be slightly more than 5,650 square feet with approximately 230 seats, including at least 30 outdoor seats. The restaurant will employee about 100 people, and will likely be open from 6 a.m. until midnight (exact hours to be announced closer to the opening date). The location will be Kerbey’s third largest, behind its Round Rock and Northwest locations. “Kerbey Lane is quintessential Austin, and we’re proud to welcome them,” says Greg Weaver, executive vice president of Catellus Development, the master developer of Mueller. “Kerbey Lane is an ideal addition to the local vibe we’re establishing at Aldrich Street. I know the restaurant will be a huge draw for Mueller, simply based on how often we’ve heard from people who work, live, and visit Mueller about how much they want Kerbey’s famous queso or pancakes here,” Weaver says. “Texas Mutual has a long history of supporting local companies,” says Rich Gergasko, president and CEO, Texas Mutual Insurance Company. "With its focus on fresh, home-made quality food and commitment to the community, Kerbey Lane Cafe was a natural fit as we considered neighbors for our new home in Mueller. Our employees are very excited about having this local icon in our building,” Gergasko says. In advance of its opening next year, Kerbey Lane will participate in Mueller happenings including the free Aldrich Street Celebration taking place on Sept. 14 from 7-10 p.m. Kerbey will join Texas Mutual and other Mueller businesses at the celebration, and will have free samples of its famous queso and roasted vegetable dip, giveaways, and the chance to win prizes.